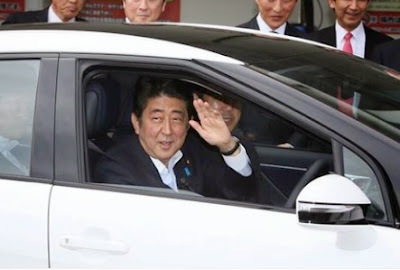 "Abe's shift in security policy will have a broader (yet minimal) impact on his national approval rating, but nuclear energy was the key issue in the Shiga gubernatorial elections, not CSD. The LDP is still the king of the land, and I suspect that future local elections will go in their favor. And with no organized or popular opposition party in sight (Mikazuki ran as an independent), Abe really doesn’t have anything to worry about." Nevertheless, there are aspects of the Shiga election Stapczynski does not mention which do have significant implications for revival of the fortunes of Japan's political opposition. After getting trounced by the LDP-New Komeito alliance in election after election since the ill-designed House of Representatives contest of December 2012, Japan's riberaru ("liberal" very much in the American sense of the word) politicians managed in Shiga to hang on in one of their strongholds. That they were able to do so at a time when the national polls show the liberal parties in total winning the loyalties of only 10% of the voters -- the LDP alone has the allegiance of 40% -- just hanging on is a major achievement. All during the post-war era, the Japan Communist Party has served as a facilitator of LDP dominance. By insisting on running candidates in almost every race, the JCP has traditionally drained off around 10-15% of anti-LDP votes, making it difficult for moderate anti-LDP candidates to compete. The big question for many has been whether moderate opposition is so down at present it has no choice but to forge an electoral alliance with the Communists, fielding joint candidates in order to capture that otherwise lost 10%-15%. The Shiga result indicates that the answer to the question is "No, the opposition does not need to accommodate the Communists, a move that could destroy it, in order to beat the LDP" -- though the nuclear restart issue clouds the conclusion. Turnout for the Shiga election was 50.15%. This seems a dramatic decline from the number in 2010, when 61.56% of the voters showed up. However, the 2010 contest was held in concert with a House of Councillors election, artificially goosing the numbers in the gubernatorial race. The true comparative is the 2006 election, when Kada Yukiko won her first term in office. The figure then was 44.94%, 5.21 percentage points fewer than in last Sunday's contest. Here's what: the margin of victory for the former DPJ MP Mikazuki was just 13,076 votes, less than 2.4% of the total votes cast. Exit polls indicate that some of that margin of difference came from disaffected New Komeito voters, a surprising 24% of whom disobeyed the party directive to vote for the LDP's Koyari. The vast majority of votes that made a difference, however, came from the ranks of the non-aligned vote, which according to recent polls, is 42.5% of the electorate (Link - J). Non-aligned voters broke for the anti-nuclear Mikazuki two-to-one, overwhelming the machine LDP vote (73% of self-proclaimed LDP voters chose Koyari). The exit polls indeed indicated that while the nuclear restarts issue was crucial on the margin, it was not fundamental to the voting patterns of the voters. Only 10.3% of the voters called nuclear power the most important issue at hand. Far more named economic growth and employment (28.4%) and social welfare (19.3%) the key issues of the election. For those thinking the economy and employment the key issues, 63.1% voted for the LDP's Koyari. - ditch the constrictive Koizumi/DPJ economic policies of a decade ago. They made some sense in the fat times of the early part of the Zero Years. After the Global Recession of 2008-Present, they make zero sense. Be big time Abenomics boosters instead, but offer an alternative "Abenomics with a brain attached"
The Second Abe Era began with 10 million voters not showing up at the polls in December 2012, turning a DPJ defeat into a runaway LDP victory -- in an election where there was were non-DPJ, anti-LDP alternatives for whom moderates could vote (and vote they did, for the Japan Restoration Party, which captured 12 million votes to the DPJ's 8 million). The message out of Shiga to the opposition is "Get the disaffected voters interested in voting -- not necessarily voting for you, specifically, just voting at all -- and the LDP can lose, just like it did before 2012." Voter turnout. Voter turnout. Voter turnout. Get it up and you are in this game again.